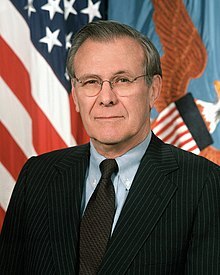 Polaiteoir Meiriceánach is ea Donald Henry Rumsfeld, a rugadh in Evanston, Illinois ar 9 Iúil 1932). Ar 20 Eanáir 2001, ghlac sé post i rialtas George W. Bush mar 21ú Rúnaí Cosanta Stáit Aontaithe Mheiriceá. D'fhág sé an post ar 8 Samhain 2006 nuair a tháinig Robert Gates isteach ina áit. Ba é Rumsfeld freisin an 13ú Rúnaí Cosanta i rialtas Gerald R. Ford, idir 1975 agus 1977. Phós Rumsfeld Joyce Pierson i 1954. Tugadh an leathanach seo cothrom le dáta an 15 Meitheamh 2017 ag 21:25.